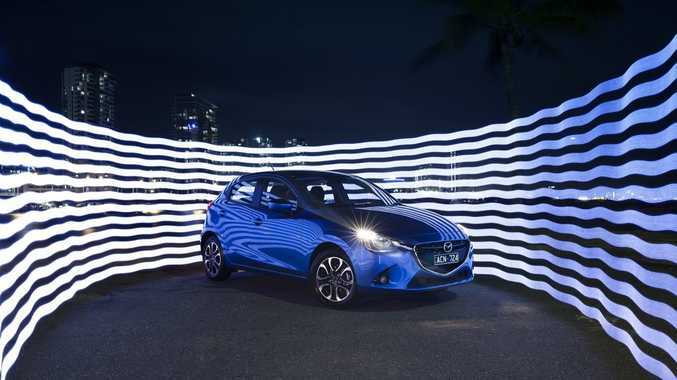 THE Mazda2 injects new style and dynamics into the pint-sized arena. Starting from $14,990 (and $16,990 drive-away), $800 cheaper than the outgoing base model, it packs a lot into a compact package. Showrooms will have stock from November 17. While the styling may not look dramatically different from the previous model, this is a vastly improved car. Driving dynamics have come forward in leaps and bounds that meets the European competition head-on. The new Mazda2 is available with a 1.5-litre four-cylinder petrol engine in two levels of tune and three trim grades - Neo, Maxx and Genki. Our test drive this week saw pre-production models impress with on-road flair and dexterity. Whereas previous front-wheel drive variants of this genre would have been understeering and had you ploughing toward the road's edge, the new Mazda2 felt composed and confident. While only generating 81 kilowatts and 141 Newton metres (the standard spec engines featured in the Neos only get 79kW and 139Nm), it feels peppy and responsive. It's available with a six-speed manual or six-speed automatic. Our experience found the self-shifter surprisingly delivered better performance. When it comes to equipment, Neos get 15-inch steel wheels, four-speaker CD stereo with USB input, Bluetooth phone and audio connectivity, air con and power windows. Maxx picks up cruise control, a leather-wrapped gear shift knob, handbrake handle and steering wheel, along with alloy wheels and access to the cool interior colour pack. Genki ticks all boxes, with 17cm colour screen, dual zone climate controlled air con, automatic lights and wipers and 16-inch alloys. Details: Five-door front wheel drive micro size hatchback. Engine: 1.5-litre in-line four-cylinder petrol generating maximum power of 81kW @ 6000rpm (79kw in standard spec) and peak torque of 141Nm @ 4000rpm (139Nm in standard spec). Consumption: 5.2 litres/100km (combined average, manual), 5.4 (standard spec); 4.9L/100km (a), 5.5 (standard spec). Bottom line plus on-roads: Neo (m) $14,990, Neo (a) $16,990, Maxx (m) $16,990, Maxx (a) $18,990, Genki (m) $19,990, Genki (a) $21,990. Add $400 for Smart City Brake Support, $250 for Mazda2 Maxx interior colour pack, $200 for Soul Red metallic paint. Inside the new Mazda2 Genki.